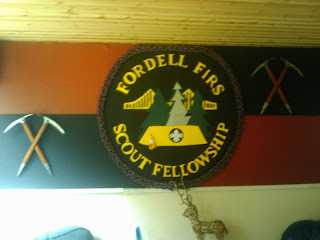 Fordell Firs Blog: Back again! 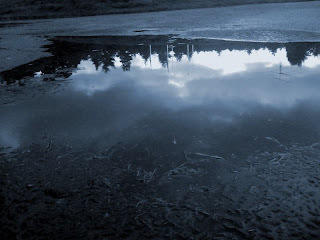 Above : Fordell on a particulary wet August day. Yes, after a well-deserved holiday the blog has returned (slightly sunburned) with some of the summer's news. After the last big event (Dunfermline District camp), the grass had a couple of weeks to recover and then it was straight into the usual busy summer period. Midweeks suddenly got much busier as we had lots of summer camps, and weekends quietened down a bit as most groups tended to leave and arrive then. The new grasscutter made a long-awaited appearance and was quickly put to good use. Previously we've relied on the tractor to cut the main fields, but it's always been fairly slow and was hard to get into some of the smaller areas. The new grasscutter can now cut both the main camping areas and also a lot of the areas which needed strimmed before, so should be able to save loads of time. 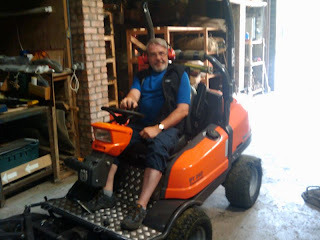 Sadly, we had to bid farwell to the old Zetor tractor, but hope it's found a happy new home somewhere else. Above : No, Henry, you can't borrow it to use as a golf buggy. Over the summer there have been a huge number of different groups, including quite a few foreign groups. Due to the busy midweek periods, 2 of the Fellowship (Craig and Stuart) were taken on as full-time summer staff and are still working there at the moment. Although the weekends were a bit quieter for a while they're now back to normal with most weekends needing 10 or 12 staff in to cover activities. 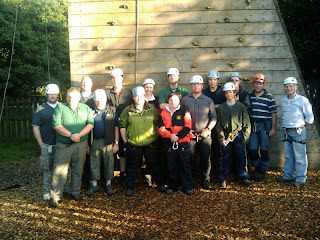 Midway through August and it was time for the annual roped activity training/assessment session again. Slightly later than usual, the first one was for the 'old' people, ie those that had been running sessions for a few years. 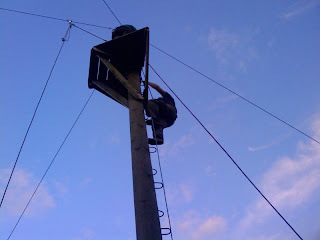 Above : Midway through the rope assessment on a fantastic summer night. As usual this was run by Steve Spalding - and there was a big attendance as we also welcomed 3 scout leaders from across the Forth Bridge who were there as part of the Climbing Wall Award. 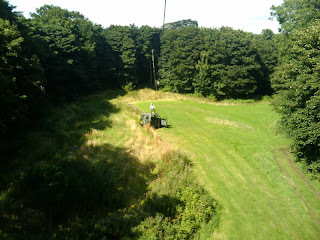 Above : Zipline training / assessment. 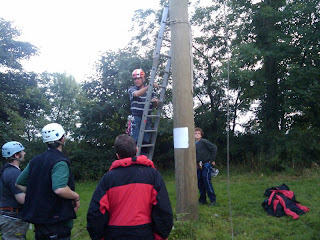 On the night we looked at the setup for climbing, crate climbing , abseil, zipline and jacob's ladder. All these have been running very smoothly over the past year and it was decided to leave most of the systems as they are. The only exception was zipline, where we looked at a few new options regarding rescue, and also played about with the new method for the instructor to climb up to the platform at the start (using an autolocking device on a fixed rope instead of having to fiddle about with lanyards while climbing the pole). A few different rescue scenarious were carried out, involving a 'random' staff member being sent down the line and told to feign unconsciousness while the rest of the group rescued him. Several major wedgies later and things seemed to be running fairly slickly. Above : Ginga rehearsing for his lead role in the Fordell Xmas pantomime (Jack and the Beanstalk). The real Jack isn't available on the day of the performance, due to family commitments. 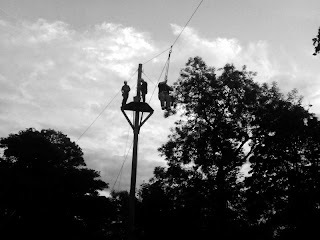 Above : Trying out some rescue techniques on the zipline. Above : 2 weeks prior to the zipline training, Craig tries to rescue a pulley which an unnamed instructor accidentally dropped down the line. 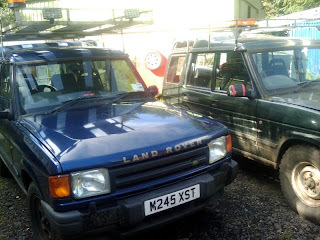 After the tractor, the old Range Rover was next to go as Bob swapped it for a slightly newer Land Rover. We now have 2 in addition to the Ford Ranger and these are only used onsite for moving trailers, doing bin runs and for using during the zipline sessions. Although the Range Rover was a definite favourite with some of the staff, due to its automatic gearbox, electric seats, electric sunroof and fancy trim, it tended to be very unreliable and wasn't particulary economical at all. Above : Replacement for the old Range Rover (no electric seats this time though). The staff hut has been having bits and pieces of ongoing work as usual - new addition to the wonderful lounge wall is 2 pairs of ancient ice-axes which were found hidden away in the depths of the main store. As it was unlikely these would ever be used again (or that anyone would actually want to), they're now decorating the back wall. 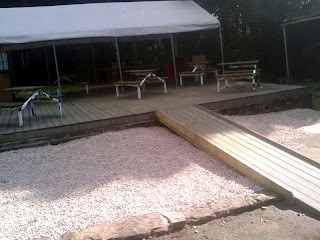 The front of the gazebo's been tidied up with the addition of some new stone chips - previously this was a muddy/rocky mess and now looks much nicer. Above : Front of the gazebo looking much tidier now. 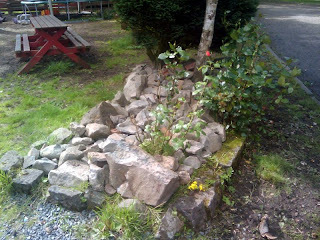 Above : Wee rock garden near the reception.